Jenny Kwan MLA contacted the Office of Rich Coleman, MLA, Minister Responsible for Housing and Social Development. She asked about follow-up on the after homelessness… community action report. This is what came back from the Minister. Very nice to hear from you and thank you for your kind words regarding the after homelessness… project and the Community Action Report. Once your staff have had a chance to digest the recommendations, we would be very grateful to hear what actions are taken in response. Personally, I am very pleased with the incisiveness of some of the recommendations and am certain that if made concrete, they would take us steps closer to real solutions in the multi-layered puzzle that is this very important issue. Thank you for your February 4, 2010, email regarding the after homelessness… project. 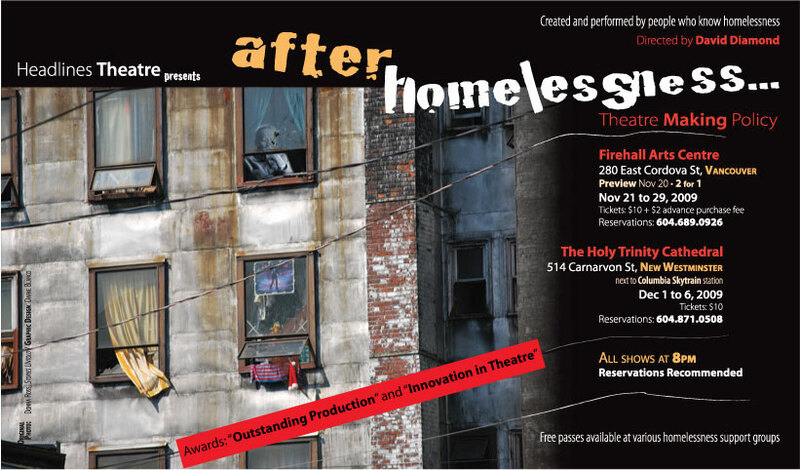 I would like to congratulate you on the recent success of Headlines Theatre Company's after homelessness… production. I was interested to read about your innovative method for soliciting input intended for responding to the needs of those experiencing homelessness. I share your goal of ensuring safe and appropriate housing for the homeless and believe that providing a wide range of services is essential to improving the lives of those experiencing homelessness. Through our comprehensive housing strategy, Housing Matters BC, the provincial government has made significant progress in addressing homelessness. In 2010/11, the budget for affordable housing and shelter will be more than $560 million, more than four times as much as in 2001. The provincial government has developed approximately 5,000 supportive housing units in British Columbia, compared to 1,300 in 2001. The province also supports Housing Outreach workers who operate in 49 communities across British Columbia. We have placed over 8,700 homeless people in housing since April 2009. We have also established the Emergency Shelter Program which has helped more than 3,400 people find permanent housing. Your Community Action Report has been shared with my staff who will review your recommendations and take them under consideration as a part of our ongoing review of programs and policies. I appreciate the comments, suggestions and recommendations that arose from your project. Homelessness is a significant challenge that requires partnerships with all levels of government, community groups and individuals to address the needs of British Columbia's most vulnerable citizens.